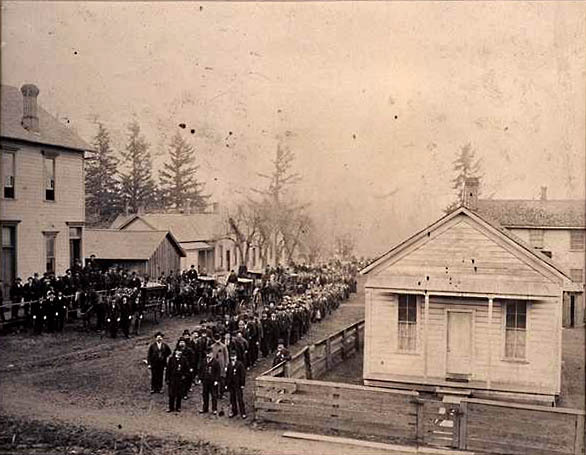 The Odd Fellows Hall holds a significant place in Lake Oswego history as a place of social and public gatherings. Upon completion, the hall was dedicated with a meeting followed by a dinner and ball. The Odd Fellows Hall exemplifies the Italianate style featuring a prominent parapet, double-hung sash windows with architrave molding and corbelled chimney pot. The Hall is one of only two non-residential buildings in the city designed in the Italianate style and appears to remain essentially as constructed with only minor alterations. The building is listed on the National Register of Historic Places. The funeral procession for George Prosser’s third wife, Dena on February 8, 1895 is assembled on Church Street beside the Odd Fellows Hall.